The printing press seemed to live. Every night for 31 years, beginning at about 11 p.m., it rumbled the building off Bragaw Street, the smell of ink wafting down the halls. From words and images, it made physical things. And then on Saturday night, it died. 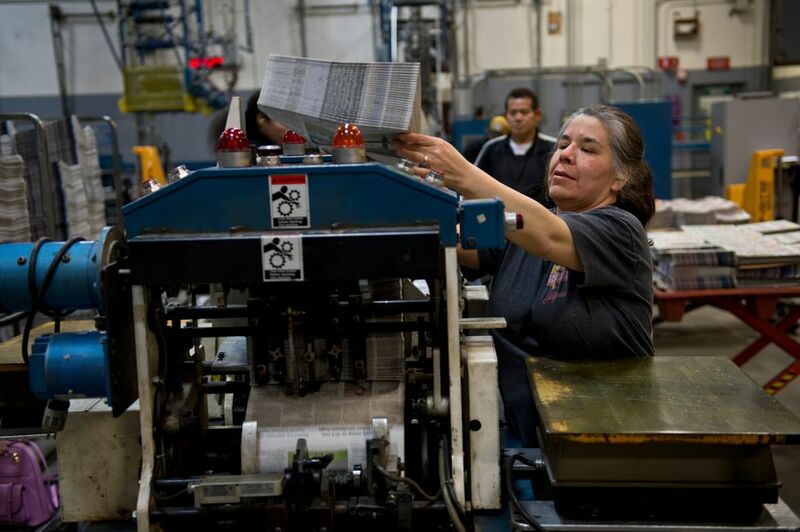 Alaska Dispatch News is being reincarnated in a form with a better chance to survive, printed by a contractor on a simpler press in a smaller plant in Wasilla. Monday's newspaper was the first to come from there. That's a hopeful story. But when the great iron beast on Bragaw breathed its last on Saturday night and Sunday morning, producing its final newspaper, its demise took more than memories. The plant was the busiest manufacturing facility in the city. Dozens of people working quietly and efficiently wouldn't have jobs when the shift was over. A layoff notice lay on a press operator's workstation. Careers of skilled, faithful workers were ending with their futures in doubt. 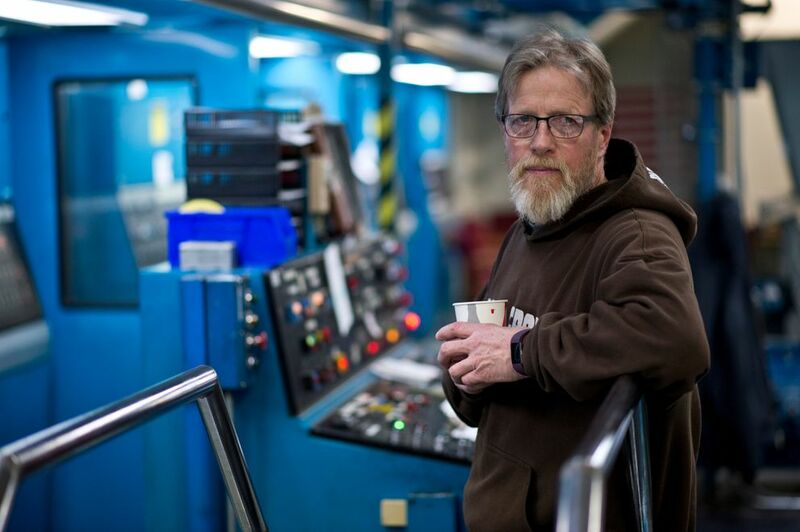 "We've never missed an edition of publication," said Gray Morris, who printed newspapers in Anchorage for 40 years. Morris started at the Anchorage Times and moved to the Anchorage Daily News when the Times failed in 1992. He won't move to Wasilla. "I didn't even apply. I'm done with newspapers," he said. I heard no one complain, but when I asked, I often found anger not far below the surface. The paper had been profitable until Alice Rogoff bought it from the McClatchy chain three years ago and merged it with a website she already owned, Alaska Dispatch. Rogoff came to Alaska with the personal wealth to buy a place in the power structure, but apparently without the will or the ability to execute a coherent business plan. She sold the Daily News building, planning to outsource printing, but was unable to do so. She bought a smaller press and leased a building for it, but botched the installation. That press never ran, and it likely will be scrapped along with the press on Bragaw. As the Alaska economy sank into recession and newspapers nationally cut costs to deal with changing economics, Rogoff added staff and started money-losing new products around her interests. By summer, with losses spiraling and Rogoff apparently unable to continue covering them, the paper nearly failed. The Binkley family of Fairbanks bought it out of bankruptcy. A new co-publisher, Ryan Binkley, has made hard choices to keep the company operating. He is running it as a business. Saturday night, Jerry Lumba adjusted ink flow to balance the color on his pages as they sped by. The press is three stories tall and longer than a locomotive. A series of doors opens into spaces where metal and paper move faster than the eye can track. The control area looks like a subway platform. Lumba began working here in 1993, making him the most junior press operator I met. He moved to Portland for eight years but came back a couple of years ago, which he now regrets. Lumba is too young to retire and took a job with the contractor in Wasilla, a 100-mile round-trip drive from his home in South Anchorage. He began printing there Sunday night. Like most production workers I talked to, Lumba blamed Rogoff for this outcome. "Thanks, Alice," he said. "This was a big game to her. And all the people here and their livelihoods are gone." Rogoff spent a vast amount of money and sincerely believed in her plan. But working people who did their jobs well are paying for the outcome — how else should they feel? Down in the packaging room, a stream of newspapers flowed into equipment that inserted ads and created bundles for delivery. Workers at those conveyors earned less than the press operators. Some full-timers will go to Wasilla, but others will look for new part-time jobs. "Not everyone can commute to Wasilla," said Suzie Smulski. "It takes two jobs." Smulski was working her last shift after 12 years. She smiled when we met. She has seen my face whiz by on newsprint perhaps a million times. We shared memories of the building. The cavernous packaging room once was full of equipment and people rushing through the night to get papers out by dawn, but now the work takes only a fraction of the space. The paper once published almost 90,000 copies. Today it's around a third of that. The Goss Headliner Press became much too large for the shrunken newspaper. It could print up to 70,000 papers an hour of 124 pages each. Operators started running it slower and still had time for extra maintenance tasks before the end of the shift. In 1985, this press was an audacious investment in Alaska's future by McClatchy. It paid off. But now that future is over. Press operator Larry Severson helped install the press. Doug Burington was there, too. He worked his way up from the packaging room. Mike Green started right out of high school in 1974 printing the Times. Saturday was his last shift with guys he had worked with for more than 30 years. "It's basically all I know," he said. Like several others I talked to, Green will use his time on severance pay to figure out if he can afford to retire. John McKay, a longtime attorney for the newspaper, came Saturday night to watch the last press run. Three decades ago he wrote the contracts to build this plant. His late wife, Suzan Nightingale, my predecessor as a columnist and my inspiration, worked in the newsroom of that building. In an old photo studio, front pages were posted from the day Kay and Larry Fanning began running the paper in 1967 and from the takeover by McClatchy in 1979. McKay read aloud a poem about Suzan and about the disappeared friends and colleagues from the glory days. Later, before walking into the night, he shared thoughts about the drama and history that went through the building. And the feeling of that ending. I had been taking notes for a column about a historic moment, like others I've witnessed as a writer. Seeing John glancing at my notebook, I stopped writing and just listened.